I just got back from spending Friday - Monday in New York City with my sister! I am both still recuperating & soaking in all that we did over our whirlwind trip. but we also did & saw SO many amazing things. If you followed along on Insta/Twitter you saw the social media explosion that occurs when two blogging sisters take their first trip together, to the amazingness that is NYC. This was my FIRST trip to NYC that wasn't a layover in an airport. - Brooklyn has very limited public transportation, but riding around with Eddie in his town car makes up for this. - Good thing I walked from tip to top of that island, because we officially ate our way from the Upper East, to Midtown, to Chinatown, to Brooklyn. - People who have access to rooftops are the ones to know. - Manhattan can be a little city too. The adorable old couple that you photograph in front of the MoMA might just sit down next to you for dinner in Little Italy. - The hype about bagels & schmear... so true! - People in the subway are weird. Smelly. In a hurry. They can sometimes be dressed as mermaids. And know how to play "Killing me Softly" on the according & the nose-kazoo. - 86 stories is tall. Thank you Empire State Building for confirming my fear of heights! - As much as you think you will see it all, 3 days is so NOT enough! Already planning our next seester trip! What life lessons have you learned in NYC? Stay tuned for more over-sharing about all the amazing food we had & my dress shopping experience later this week! How fun! I love NYC, one of my favorite places on earth. And your outfit is adorable! Looks like a blast! I love a good seester trip!!! You look fabulous! Can't wait to hear all about THE DRESS. Looks like you had so much fun from your Instagram snaps! gorgeous look! adore the dress and have fun! I totally lived vicariously through you on this trip, I love NY! Can't wait to hear about dress shopping! You look so gorgeous in this dress and I love the white blazer! Perfect for an NYC trip. Seriously, I don't know how people walk for hours in the city with stilettos. Can't wait to hear about dress shopping! Sounds like an amazing 3 days! This is such a cute look for running around the city. 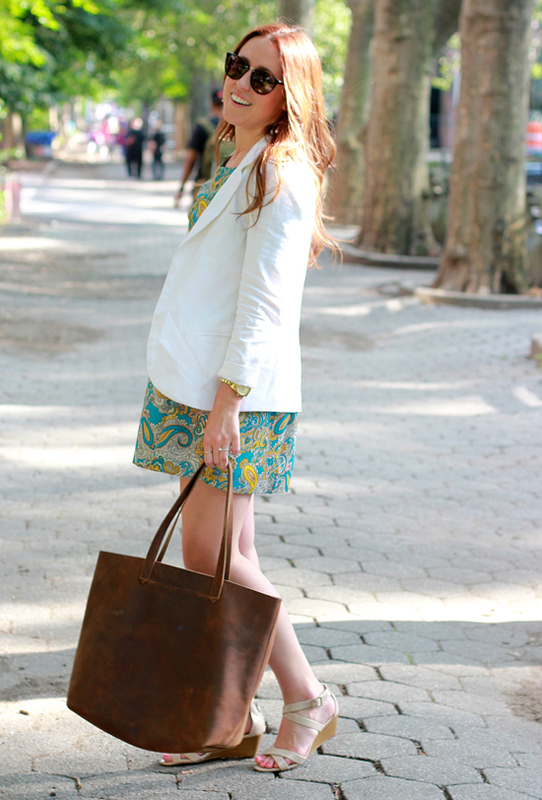 I'm always a fan of a blazer over a summer dress. I've lived in NY my whole life and it's still not enough time to see it all!! Cute outfit! So glad you had fun in the Big Apple! I think my feet are finally beginning to recover! Thanks for one of the best weekends ever! LYLAKBLE!! Great New York outfit! I love a good sister trip! People on the subway don't always dress up like mermaids, sometimes they don't wear pants (see: No Pants Subway Ride)...and you should see the get-ups on Halloween :). Looks like you had a great time, glad the city treated you well! I love that print, it would be great on a scarf. I'm not sure I've ever seen proportions done so perfectly. You look amazing! I'm secretly hoping that you went to Kleinfeld's and I'm going to see you on an upcoming episode of Say Yes to the Dress.... The life lesson I learned in NYC was "Oh, my friend lives on this really cool place called Roosevelt Island... Wait, it used to only be home to insane asylums up until the 60s?!" It was an interesting trip. PS- The best part of this post is that I finally found you on Instagram! NYC sounds amazing even all the mermaid weirdness , loved reading every detail of this post. Just checked out AirBnB! Crazy... reminds me of "couch surfing". How did you hear about it? And how was your experience using it? I lived in the city for a few years and I am still to this day afraid of the people on the subway! Haha. You look stunning!!! My sister & BIL had used it before & had nothing but good things to say about it so we decided to go for it again. Our experience was wonderful, I literally have nothing bad to say about it. Our hosts were home the entire time, but very accommodating, supplying us with insider info about the neighborhood. The area we were sleeping was just a little room with bunk beds, but since we were seriously only there for maybe 1 hour in the afternoon & then to sleep it really didn't matter. We saved money that went towards exploring the city & eating like queens! I think the review system that Air BnB has in place is very strict, so you won't be staying with a creeper! Love this look! 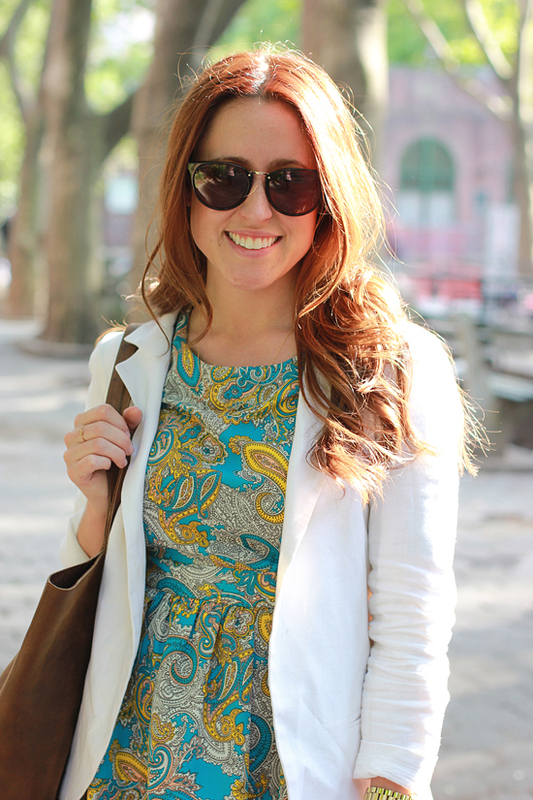 The paisley is perfect for summer... but I'd imagine it will still work really well in the cooler months! Life lesson from NYC: You WILL drape yourself all over the shirtless Abercrombie model on Fifth even though he is literally half your age. Sounds like you had an unforgetable trip!! I only visited NYC once for a 5 day trip with my family when my older brother was stationed there. I just remember it being larger than life with so many people and crazy taxi drivers! We stayed in the Double Tree right in the heart of times square by the huge two story McDonalds! I would love to go back but since I live in Cali, it's quite expensive for airfare! Can't wait to hear about your dress if you found one! love your dress, hope u have a fun time in nyc! xO! I LOVE your paisley dress (wish I still had an H&M near me #sadface). I've also visited NYC and tried to wear cute footwear that I've thought was going to be comfortable enough and had to purchase flips or flats. You live and learn right? Can't wait to hear more of your stories! You look gorgeous and I LOVED following your adventure on Instagram! I am heading to NYC in July and all of this just made me more excited about it! Yay yay yay! You are going to have a blast!! Wish I was stuffing myself into your luggage! Seriously already planning my next trip back! Love this outfit! I have never been to NYC and can't wait to one day visit all that the city has to offer. great post...i haven't been to NYC since i was a little kid! dying to go back some day...soon! i would agree, tho, 3 days is not enough! You do! I bet you could scoop one up for a song during the 4th of July sales this weekend and next week!